GLEN ALLEN, Va., Oct. 23, 2018 /Christian Newswire/ -- A recently released book titled "Giving Hope An Address" chronicles the lives of David and Don Wilkerson in the establishment of the worldwide rehabilitation ministry of Teen Challenge. Julie Wilkerson Klose, the niece of David Wilkerson and daughter of Don Wilkerson, takes readers behind the scenes in the lives of these two brothers and tells a powerful story of the power of prayer and the burden to reach those lost in addiction. Teen Challenge has 1400 programs in 125 nations. This year Teen Challenge is celebrating the 60th anniversary as the most successful faith-based drug recovery ministry. 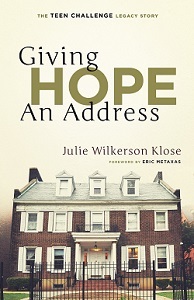 In today's tragic Opioid epidemic, "Giving Hope An Address" is a timely story of how the gospel of Jesus Christ continues to heal those with life-controlling addictions. This book is the continuing story to the bestselling book "The Cross and the Switchblade" by David Wilkerson and gives testament to why the legacy of David Wilkerson and the ministry of Teen Challenge continues throughout the world. Endorsements by: Eric Metaxas, Dr. Michael Brown, Pastor Jim Cymbala, and many others. Review copies available on request at jjklose@hotmail.com. For more information visit: www.julieklose.com and www.bridgelogos.com.